Science Project Ideas - great homeschool science projects you can do at home! Science is full of experiences and through easy science experiments and projects you will add to your learning of how the world works! List the steps, show off a photo, make notes and record it right here for others to enjoy and use! Check out the wonderful science project ideas added by other homeschooling families just like yours and inspire us! My brother and I (with mum's help of course) combined water and vinegar in a plastic bottle. Mum rolled up some bi-carb in a paper towel and she twisted the ends like a lolly. We decorated a cork that fit the bottle with red streamers like a rocket. We sat about 3 metres away while mummy put the bi-carb lolly in and put the cork rocket very quickly in. We counted down but nothing happened!!! So mummy had to shake it to help blast it. A bit later the cork blasted off into the air. It went really high! Why you ask? Because bi-carb mixed with vinegar makes a gas that rises and pushes the cork out with the force of air. Hope you like our cool science project idea! 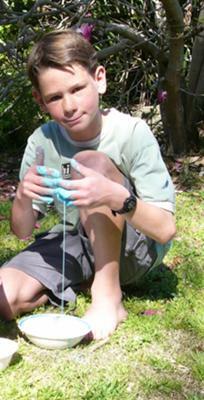 We started the year with a homeschool science task which proved to be very worthwhile. The challenge was to design an experiment or set of experiments to test who was the strongest member of our family. From this we discovered that we would have to think about different types of strength, and for which specific strength we were going to test. Also how to keep the variables at a minimum for fair testing and accurate results. Lots of measuring and weighing was needed, as well as the design of our own fitness equipment, weight bars etc. The children's ideas were really different to my own and when I tried to write up what we had learned at the end of the week, I was amazed at the variety of learning that had been accomplished - much more than just science. Talitha, Micah and I made gruesome goo. We had lots of fun playing with it. You knead two cups of cornflour, one cup of water and a few drops of food colouring. I made blue goo, Micah made green goo and Talitha made pink goo. We made it into balls and then they turned hard. Then we wet it and it became sloppy again, but it was too sloppy, so we put it in the microwave for a few seconds and the water evaporated. We are studying about Geology. Rock formation to be exact. First, we hiked to many different locations. The Mountains, near the beach, Walmart, everywhere, and picked rocks! We keep ziplock bags and index cards, each rock that we find we note where, when, and then number it. Then put it in a bag, sealing until we get home. After we get home, we take out one bag and examine the outside. We guess what class it's in, and then the fun begins. Armed with a hammer, magnifing glass, and safety glasses, we get to smash open the rock. We note if its grainy, does it have layers, or did we find a fossil!@!!? Then we look up in our rock hunting handbook, and see if our guesses are correct. Life Science Projects - are all about life science - living things and how we can observe and take notes of what is around us. 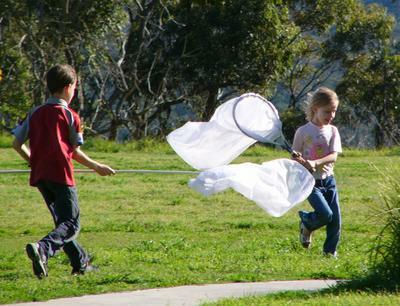 This works well with nature study and outdoor science activities. Here are some ideas which you can easily do at home. My mum made butterfly nets with me. We bought some curtain material. Then we took the middle part out of an old tennis racket and we sewed the curtain material around the racket. We made the nets long. We also made a butterfly net with a long pole. Then Joel and I (Talitha) went outside to look for some butterflies, but we only found bees because it was still winter, and no butterflies were out just yet. I made two bird boxes. The first one I made out of wood from our garage. I started making the bird box a few months ago but in the end it only took a day. 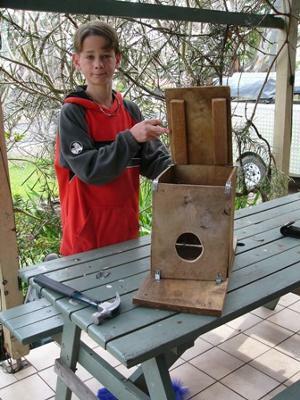 The second bird box I made out of an old sub-woofer which is a type of speaker. You can see my pictures below. I placed some food on the platform of my box and then a mynah came and ate the food, but a lorikeet came and scared it away. The lorikeets have been observing my subwoofer birdbox. 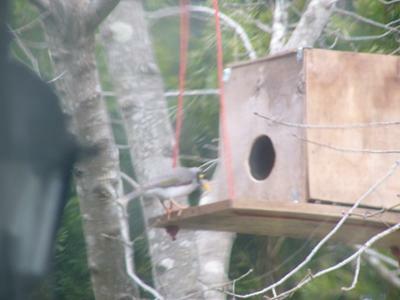 The male has been dancing and showing courtship behaviour in front of the female while standing on the feeding box we made a long time ago. We love Supercharged Science and wholeheartedly recommend their program! ... and Yes! 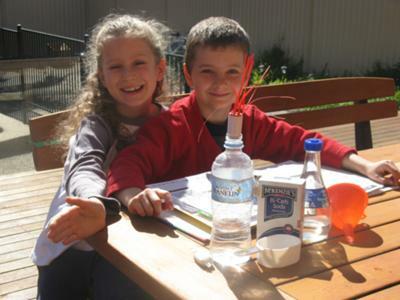 Many of our science project ideas and experiments are from SCS! Do you have a picture or photo which explains your Science Experiment? Great! Click the button and find it on your computer. Then select it. 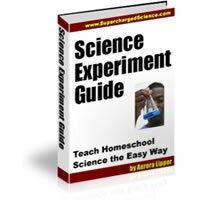 Click here to get the Free Science Experiment Guide from SuperCharged Science. 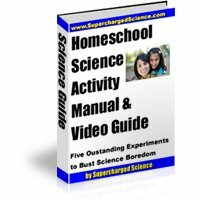 And ... download a copy of the Homeschool Science Activity Manual & Video Guide. Have a great specimen to show us? Add to the Online Nature Journal.